Francis Flower is a specialist in minerals management, storage and processing. The company provides a range of high-quality powdered minerals, limestone powders and super-fine white marble powders for various industrial and consumer products. A key business focus is the recovery, reclaim and recycling of mineral by-products. This reduces the need for mineral extraction and landfill. The super-white marble powder used in Francis Flower’s Fordacal range of fillers and extenders is made with recycled marble. However, to achieve the highest quality of powder, a consistent particle size must be guaranteed. The company utilizes Russell Finex industrial separation equipment for this part of its process. Francis Flower required a sieve capable of meeting the desired 30-minute loading time for a 28-tonne tanker. With its considerable screening capacity, the Russell Compact Sieve® was the smart choice for this application. This mobile sifting system for bulk materials is applied between the bulk loading silos and delivery tankers to screen the marble powder before it is shipped. 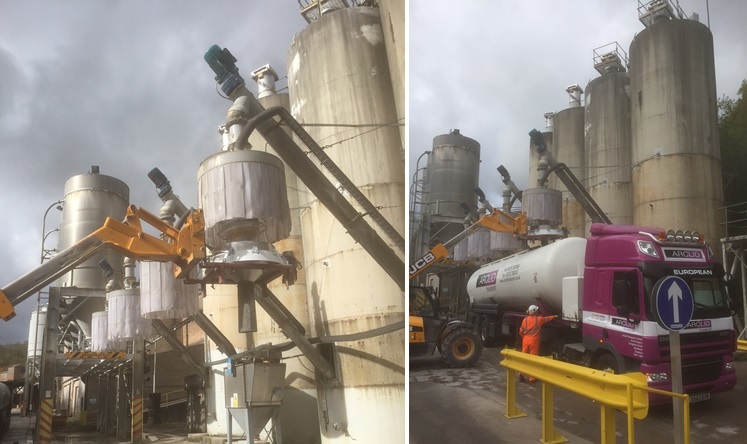 To allow for easier connection and loading to each tanker, the vibratory sieve unit is transported and elevated into position above the tanker using a telescopic handler. The Russell Compact Sieve® range of mobile vibratory sieves removes oversized contamination from bulk powders and granulates. These vibrating screeners are ideal for high-capacity screening where space is limited, or in instances where a mobile solution is necessary. The units fit neatly into production and filling lines to check-screen incoming or outgoing materials. An innovative design means these industrial screeners are less than half the height of a traditional sieving machine, and a wide range of sizes and customizations are available to meet specific requirements. Contact Russell Finex to discover how a range of mobile vibratory sieving equipment can optimize your bulk loading process.